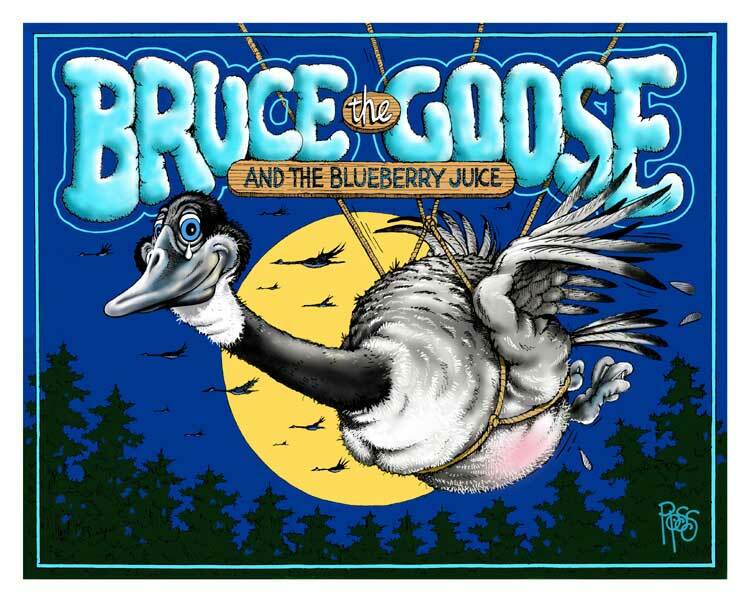 And it was home to a goofy ol’ goose they call Bruce. And bears and some deer and one or two mooses! The trees where sky high and the grass was so green. And the rivers and lakes were perfectly clean. The place was fantastic, it was nicer than nice. For a goose to leave this he’d have to think twice! “Cept in the fall when the temperatures dropped. As he gobbled down goodies wherever he went. And he stopped by each one for a couple of munches. And Bruce thought his tummy would make a good storage. So he ate some of this and he ate some of that. He ate and he ate and he got kind of fat! But still he kept eating, he just couldn’t stop. And the more that he ate the fatter he got! But Bruce was real big, especially his middle. He could no longer fly, even walking was tough. The other geese said, “Bruce that’s enough! The next time you try to fly with the flock. Our summer is fleeting and autumn draws near. To hearken to geese who were constantly bleating. He squawked, “I’ll be fine, just mind your own matters. Of the breeze that was blowing from over the hill. It got his attention and he knew what it meant. The breeze was a warning of nature’s intent! To prepare to fly south to avoid Winter’s fury. And without heading south he’d be caught in this trap. As he pleaded for help from the geese in his flock! But I forgot to remember the seasons would change. If I’m to fly south!” he babbled and yelped! But the geese weren’t impressed with their berry-brained friend. So he screeched and he squawked again and again! I’m fatter than fat and my feathers are loose! And I always fall down when I’m trying to run. I’m still one of you and who can deny it. I’m plump but I’m sweet!” he cackled a shout! They decided to help, what else could they do? For the next several days they planned and they plotted. The T’s were all crossed and the I’s were all dotted. Though getting him up there might take several tries. To finagle and figure a high flying way. And away from the cold the geese could all sneak! He flipped and he flopped but still they kept trying. They pulled and they pried but that was too tough! And they gave him a push but it wasn’t enough. If he’d lend a hand and he said that he would. And frighten ol’ Bruce with a snarly bear snort. But at least the old bear gave a heck of a try! But Bruce didn’t smile, if you know what I mean! It seemed Bruce the Goose’s days were now numbered. He’d eaten too much, he really had blundered! What else could they do, their plans had unraveled. Not one single foot had Bruce the Goose traveled! That promised to help ol’ Bruce with his flyin’. And attached it securely to this grounded goose. The rest of the geese who would do all the flying. Where they’d stretched some long ropes to the banks just beyond. The lines were connected to the harness securely. “It feels rather weird!” said Bruce so demurely. As they gathered ‘round Bruce for one final talk. The leader then asked, “Hey Bruce are you ready? ‘Cause he knew this strange flight wouldn’t be easy. The geese all took off to attempt this grand stunt! While the blood in his feet squeezed up to his face! And the eyes in his head nearly turned inside out! Except for big Bruce, but at least he was trying. Toward the end of the lake just before the big hill. But he slid he sure did and away he did go! But then without warning the geese felt a jerk! And a dip and a flop and quite a few flips! As he spun in big circles and curly-cued twice! Over and under as he flipped upside-down. He teetered and tottered and whirled all around! But wouldn’t you scream if this happened to you? At the end of the lake where the ice meets the dirt. He finally kerplopped… and that had to hurt! Who was now tightly wedged ‘tween two giant spruce. “Bruce can you hear us? Bruce can you speak? As he hung upside down between the two trees. As he reached to inspect a bump on his chin. But determined he was to get on with the flight. Bruce and the flock made a brand new commitment. With an eye on the sky and that big batch of blue. They tugged and they shrugged and everyone pulled. This time they would make it, it just had to happen! So each of the geese did twice as much flappin’! Bruce closed his eyes as his feet left the ground. Up, up and away ol’ Bruce did abound! “To the top of the sky!” He excitedly chimed! And he flapped even more and he flapped ’til he gasped! “Til he sailed just above the tall trees on the hill! ‘Cause by now he was winging a mile above ground! As they all headed south on that cold Autumn night. ‘Cause he’d lost twenty pounds while flying up yonder. But the farther they flew the tougher it seemed. The wind from the south it howled and it screamed. And the blast from each gust their strength began taking. The geese had to struggle to keep themselves going. How far they had flown there was no way of knowing. While Bruce tagged along in that silly old halter. Some deep hidden strength of any old kind. ‘Til this flock in the sky couldn’t fly any longer. And needed to rest ’til the howling winds passed. But Bruce, you’ll remember, was surely improving. He’d lost so much weight his parts were now moving. Bruce knew he must help so he gave a big grunt. As he battled so hard to brave the bold breeze. And he passed all the geese and not a one muttered. Now Bruce was the leader, the geese could all see! Each was so thankful for the pull he provided. For some help at this time they were truly delighted. To fly farther south to avoid Winter’s toll. In a matter of days the south was in sight. And not a moment too soon, could there be any doubt? These foul weather fowls were plum tuckered out! This gaggle or geese was rather astounded! How could it be that Bruce saved the flock? You can bet your bird feathers it came as a shock! Exclaimed the whole flock, and other such stuff. And hoped they might say it again and again. And that includes Bruce that shapely ol’ gander. If judged by that skinny ol’ measuring tape. And Bruce still looked great and he had a good reason. Had impressed Bruce the goose really quite nicely. And soon to the north these geese would be winging. Had decided that their days of winging were through. “We plan to stay here”…. and it came as a shock! But you have to admit that these oranges are neat. And the sand on our toes adds quite a nice touch. And the shade where we rest by the coconut tree. And it’s gotta be better than the north’s biting cold. At the feelings they felt way deep down inside. Soon one of the geese had broken formation. As he dove to the ground he shrieked with elation. “I’m staying right here! The south is now home! As they all circled back to their fine Winter nest. And mangos and oranges and other south things. And dancing on beaches and singing and eating. As they gathered their lives in the warm southern sun. And as tough as it was there were smiles on their faces. That this living down south hadn’t hurt ‘em a bit! “Bout how this good goose tale ended so well. Which left all the guy geese with wide open eyes. And the geese in this gaggle lived happy long lives. That this little goose story has ended this way!